Looking for more auto repair and restoration clients in your local auto business? ZeroBull Marketing has helped numerous Body Shops, Paintless Dent Repair Techs, and Mobile Paint Techs dominate their local market online. 91% of all people living in the United States go online to look for businesses. Where does your business stack up online? Are you one of the first selections on Google when your potential clients are looking for the repair or reconditioning services you provide? There are 3.5 billion searches made on Google every day, and if you’re not on the first page, you are losing clients to your competition. At ZeroBull Marketing we can help! 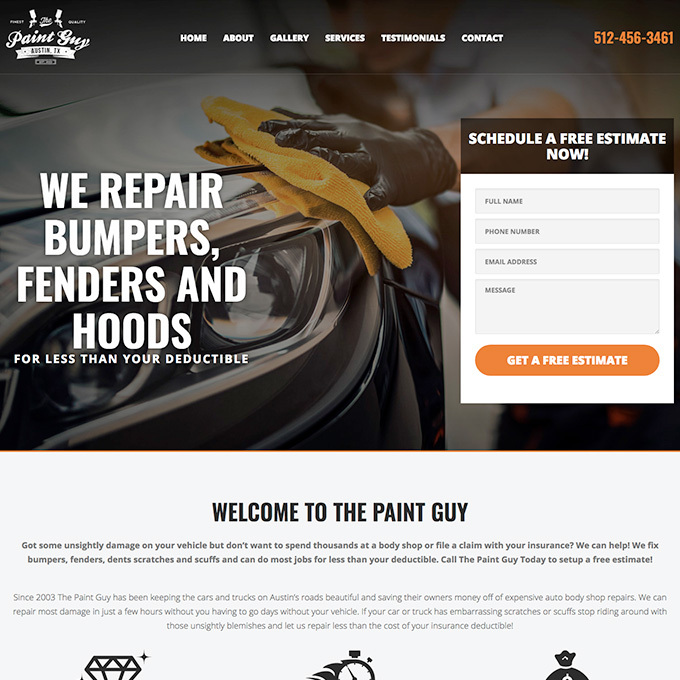 We are experts at improving visibility to potential clients, so they can find you and get in touch with you when they need an auto body shop, bumper scuff repair or paintless dent repair technician. The #1 complaint that we hear from business owners in the Auto Repair and Auto Recon industry is that there’s not enough time to keep up with and manage all the things that are required these days to make sure your business can be found online when your clients are looking. From SEO to Pay-Per-Click to Social Media – each of these strategies is time-consuming when you ensure that they are done right. What we provide is a turnkey online marketing solution for the auto industry’s businesses, so that they can focus on what they’re the expert at; running their business! We ensure that these people can find you by providing strategies and tactics that are suited to the size of your business and budget. Each of our marketing packages comes with a beautiful, modern website that will stand out from your competition, local SEO services and a highly targeted Google Adwords campaign for a flat monthly rate. 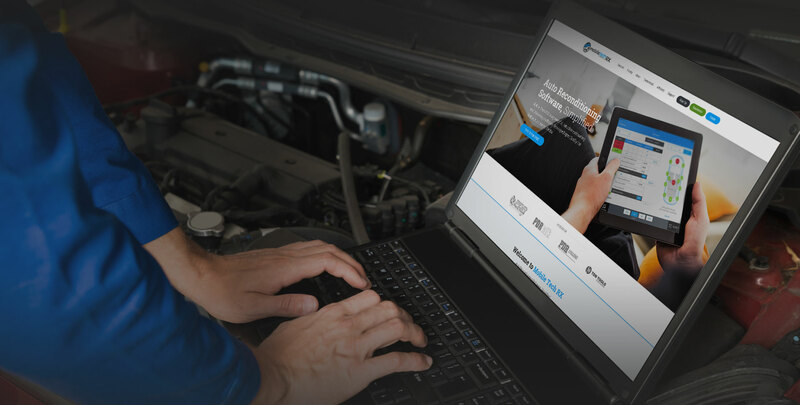 While there are numerous marketing agencies offering similar services, ZeroBull is one of the few that works exclusively with the auto repair and auto reconditioning industries. Over time, working in this niche market has helped us acquire an insight into how to get results in this industry as well as understand what your challenges are as it pertains to your business. There are many benefits a PDR marketing company can provide to you. Let’s Start Generating More Leads! Unfortunately, there are a lot of businesses in the auto repair world getting ripped off because of all the factors just mentioned; the increase in demand for online marketing services, owners who are busy running their business and don’t know any better, and shady marketing companies looking to exploit all these factors. Pushy salespeople, crappy results, and an impersonal service … these are all unacceptable things that a lot of our competitors provide other businesses and they are just a few of the things that make us different than most agencies. When you hire ZeroBull, you can expect the following from us; honest and realistic expectations from the jump. This means we aren’t going to tell you what you want to hear just to get your business. More importantly, we get results for our clients. Every marketing package we offer includes a website, local SEO services, and a paid advertising budget which means that we are driving leads in the immediate and long-term – the best of both worlds. Due to us being deeply immersed in the auto repair and auto reconditioning world, we are able to offer you a level of insight, service, and expertise that none of our competition can provide. You could start seeing the benefits of using a PDR marketing company in just weeks. Your website is the foundation for everything that you’re trying to accomplish online. Zero Bull will build you a beautiful, modern website with all the latest technological bells and whistles that will convert your visitors into leads. To flourish in your city or area, you need to make sure that your site ranks high on Google and Yahoo/Bing when people are searching for the types of repairs that you provide. Our Local SEO services ensure that happens. The beauty of PPC is that unlike SEO, it delivers results immediately. This means that as soon as your website is ready, we launch your Google Adwords campaign that drives traffic to your business that very same day. While most of our client’s don’t hang on Facebook all day long, having a social media presence that is regularly sharing content and building a following is a critical component of your online marketing ecosystem. Reviews are critical to winning online. Zero Bull will help your make sure your business is getting positive reviews and we work really hard to suppress or eliminate negative reviews from unhappy customers. Craigslist pages in every city are littered with auto repair guys with no branding or identity for their business. Don’t be one of those guys! We’ll help create a logo that reflects your business’ personality. MobileTech is a app created by Paintless Dent Repair Techs that allows mobile PDR, Paint and Wheel Repair Techs to work more efficiently, invoice clients more seamlessly and track all their employees work all from their smart phone. 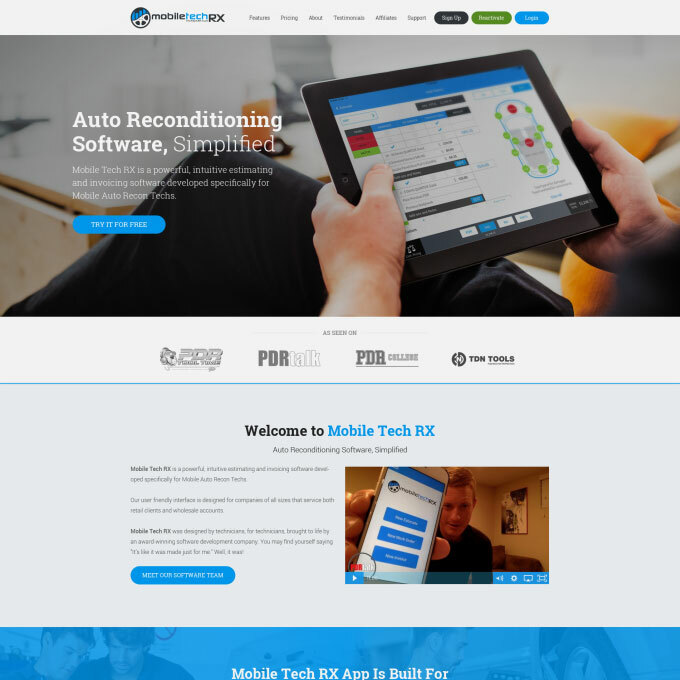 MobileTech needed a website that marketed their app to all the trades that their app is built for (PDR, Paint and Wheel Repair) and most importantly converted them into customers. We designed their website from the ground up based on their preferences and helped them create the content that has compelled their site visitors to start using their app at a rate well above industry average. 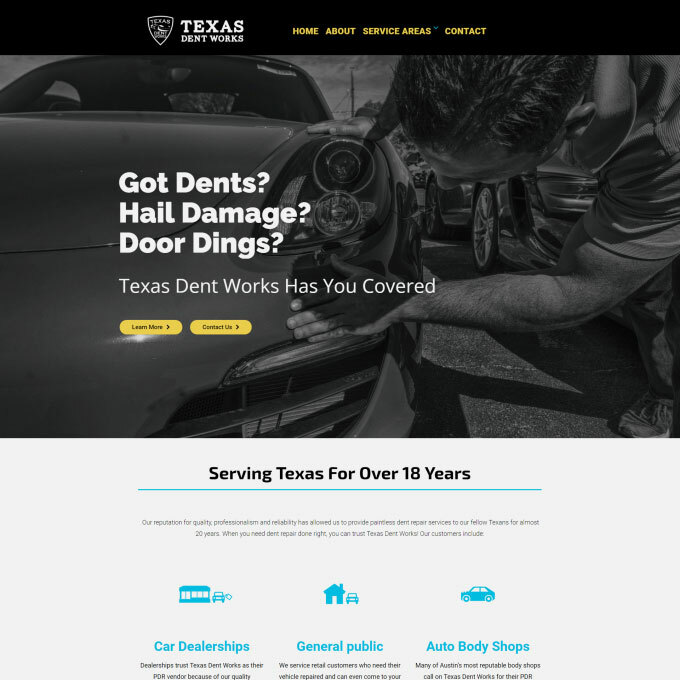 Texas Dent Works is a PDR company located in Austin, TX that recently opened up another location in Mckinney, TX. They provide paintless dent repair services to car dealerships as well as retail PDR services to the general public. If you are in the PDR world, you are very familiar with how competitive the industry is and how many competitors will move in literally overnight in the event of a hail storm. The demand that these storms create for the PDR industry are great but also created a need for Texas Dent Works to establish a strong local presence that built trust with people searching for PDR. We designed a WordPress site for them, helped them create all their content and did all the local SEO necessary to accomplish those goals. The Paint Guy has been keeping the cars and trucks on Austin’s roads beautiful and saving their owners money off of expensive auto body shop repairs. We can repair most damage in just a few hours without you having to go days without your vehicle. If your car or truck has embarrassing scratches or scuffs stop riding around with those unsightly blemishes and let us repair less than the cost of your insurance deductible! Why Is Competitor X Rank Higher On Google When I Do Better Work Than Them? Google’s search engine results are not merit based in any way. Google’s results are based on an algorithm that takes into account over a 100 different variables – all of which have nothing to do with the quality of work your business performs. Things like, what websites link to your website and whether or not your site functions well on a mobile device has much more of a bearing on where you rank on Google than the actual quality of your work. How Long Will It Take To See Results From This? All of Zero Bull’s marketing packages consist of Local SEO Services which take time to rank your business and a PPC campaign which puts ads up for your business immediately. This means that your business starts driving leads from the day that we launch your campaign. Over time the lead volume should only increase once the benefits of our SEO efforts being to impact your organic and map rankings on Google. We have three different packages for depending on your businesses’ needs and budget; $750, $1500 and $3000. Each package comes with an increased pay per click budget which will help drive more clicks and leads to your business. Can I just get a website but not do marketing? Yes you can. A website on it’s own with no SEO or PPC will not generate very many leads but for some techs who service dealerships only, the only thing they really need is a web presence and we are happy to provide that. Although the pricing is not listed in our price sheet, email us at info@zerobull.marketing and we’ll provide you a quote for a site. What Guarantees Does Zero Bull Offer? We don’t make any guarantees with regards rankings or lead volume – those things are impossible to predict. But we do guarantee all the work you are paying for from content, to SEO to your PPC campaign will be performed exactly we say it will. We also guarantee a 4 hour response time on all website edit requests and a 99.9% uptime guarantee on your site. Other than looking Good, what will a new site do for me? The biggest thing our sites do very well I they convert browsers into buyers. Getting someone to visit your site is half the battle but compelling your visitor to pick up the phone and call or email you is the much more difficult part of getting clients and we are experts at ensuring that is happening on a daily basis.